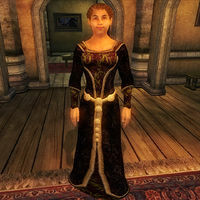 Rosentia Gallenus is an Imperial commoner living in Leyawiin who is having some trouble with a certain Daedric artifact she recently purchased. Since she bought it, she's been plagued by a bunch of scamps who won't go away. Before someone helps her by getting rid of the scamps, Rosentia will stay secluded in her house, wandering aimlessly around the ground floor and waiting for someone to come to her aid. She takes a single break at 8am to have a brief breakfast during two hours. However, once she is rid of the staff, she will resume her typical schedule. She will sleep on the second floor from 12am to 6am every day. She starts the day by strolling around her house for two hours. At 8am she will head to the dining area to have her breakfast during three hours and once she has finished her meal, Rosentia will head outside to roam around the streets of Leyawiin, occasionally talking to the other townsfolk. She will return to her house at 7pm to have her dinner in the dining area until 10pm. At that time, Rosentia will find a good place where she can sit down to read her copy of The Book of Daedra for a period of two hours, until she finally heads to her room upstairs to sleep at 12am. Rosentia's attire consists of a set of upper-class clothing, consisting of a black & burgundy outfit and a pair of gold trimmed shoes. She also carries her copy of The Book of Daedra, the key to her house and a leveled amount of gold. The first time you meet her, she will immediately express her unhappiness about the situation she is living with, without even introducing herself:"These stupid scamps are driving me crazy!" If you agree to help her, she will be relieved that someone has finally decided to give her a hand:"Oh thank you! I had a feeling buying that Daedric staff would be trouble. Now I'm paying for it with more than just some gold." If you inquire about the mysterious artifact, she will explain to you in detail how she acquired it:"A few weeks ago, a spellsword was passing through Leyawiin and heard that I like to buy curiosities. He wanted to sell the staff you see me carrying. I eagerly bought it, knowing the value of Daedric relics. In fact, I was a bit suspicious when he sold it so cheap. His loss, my gain I figured. After examining it for a bit I noticed a small word carved on it in runes. Using a book from my library, I translated it. The word was nonsense. However, when I spoke it and held the staff, four scamps suddenly appeared! I thought I was done for! Strangely, they all just stood there. It didn't take long before I realized they were following me! I couldn't be seen in town with scamps following, so I decided to discard the staff. I can't explain it, but somehow I can't compel myself to actually let it go. This staff is obviously cursed! Now I'm stuck with it!" If you ask her about the annoying little beast inhabiting her house, she will express her discontent towards them:"The beastly little creatures are nasty, smelly, noisy and wrecking my beautiful house! I must be rid of them! I can't let people know I have scamps in here, or they'll think I've taken to Daedra worship. Try explaining that to the town guard." On the topic of Leyawiin, she will tell you about her reputation as a collector around the town:"Everyone in town knows about my hobby... collecting unusual examples of the arcane crafts. My husband left me quite comfortable, bless his cinders. What will I do with my collection of curiosities when I go? Donate them to the Castle, of course." The people of Leyawiin seem to have noticed the recent events concerning Rosentia, as they will occasionally say:"Have you been near Rosentia Gallenus' house recently? Smells horrible... like she left some meat out to spoil", "I was walking past Rosentia Gallenus' home the other day, and I heard these strange animal noises or something from inside... very odd" and "Every time I pass by that woman's house I hear odd animal noises and smell a foul odor. Maybe she's caring for some sick pet or something. Whatever it is, she should clean up her act. It's surprising that a wealthy woman like that would let her property fall into such disarray." However, once you have helped her to get rid of the scamps, the townsfolk will also comment on it:"I guess Rosentia Gallenus got rid of whatever barnyard animals she was keeping inside her house. Smells much better now." Her key is called "Gallenus Rosentia's Key" instead of using her correct name. This page was last modified on 4 January 2019, at 03:15.